The venerable and ubiquitous mode of transportation for anyone in Japan is the mamachari. The mamachari is a portmanteau of Mama and chariot. Japanese people love mashing words together and the mamachari is one of those words. I laughed when I first learned about the meaning of the mamachari but when you see a real expensive mamachari, you realize why they call it that. They are simple, sturdy, and throwaway items. A basic mamachari can run you around 10,000 yen to start and expensive ones with electric motors can run up to 200,000 yen, maybe more. The basic mamachari is nothing more than a sturdy steel tube bike that appears to be designed more for women as the top tube is bent all the way to the floor. The front often has a basket and the rear usually has a luggage rack. There are mud guards, a front facing light, a standard bell, and integrated bike lock on the rear wheel. It is everything you need in a bike for a relatively cheap price. It will get you to the store faster than you can imagine and bike parking is plentiful at most supermarkets. While the basic mamachari is pretty cheap, things get more complicated as you add costs and adjust the options. You can add a rear basket instead of a luggage rack, and you can change both front and rear baskets to be children’s seats, or even a children’s seat/basket combo. Add fancy lights and an electric motor and you soon realize that the price has more than doubled the base price. Like a car, you can either buy a cheap Tata Nano or you can buy a Bentley. Fixing mamacharis are not difficult but the disposable nature of a mamachari makes it hard to justify fixing them. 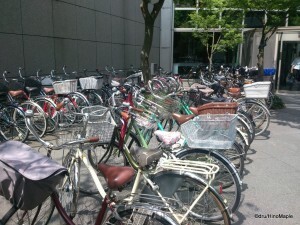 Everywhere you go in Japan, you’ll see the mamachari as they line the streets and bike parking lots. You will also see a plethora of “dead” mamachari around the big cities as people just abandon them after a while. Some are still perfectly good but they are either forgotten or the key lock was lost. They can also be pretty dangerous for pedestrians as people just have no sense of manners when it comes to mamachari. I have been buzzed countless times by teens not paying enough attention and by impatient business people trying to get somewhere. Be aware that they are everywhere and will not hesitate to mow you down (okay; that was a joke). If you are planning to live in Japan, a mamachari is a very useful investment and necessary if you live a bit away from the centre of the city. 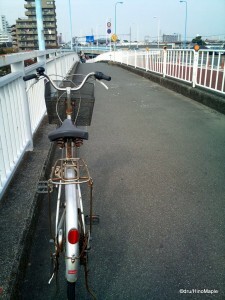 This entry was posted in Culture and tagged bicycle, bike, Chariot, japan, Japanese bicycle, Mama Chariot, Mamachari by Dru. Bookmark the permalink. I have to pedal? Cool! I’ll drive like a Jo’burg taxi driver. I’ll wreak havoc and decimate Tokyo’s pigeon, lapdog and obachan populations. The name is hilarious, like many japanese words imported from foreign languages. It took me a moment to realize that the “mama” was really the same as it would be in english. Funny. My mamachari cost ¥7000 at Bic Camera. It’s now so rusty that it’s held together by prayers and willpower. I don’t use it that often – I’m mos a walker – but it’s convenience (sic) to go to shopping (heh) at the local grocery store. Oh, I mainly use mine for getting food for Sox. Need to go 1 station over, so it is easier to just cycle there.